Cookies: Not the baked kind. How do I get TeamViewer? Go to www.teamviewer.com Click on the Download Button, usually found on the home page. How do I update Teamviewer? 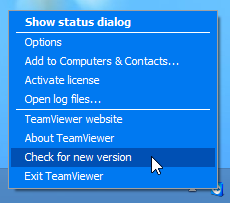 If a new version of TeamViewer is available, there will be an arrow icon on the main window of TeamViewer at the right hand side of the menu bar. In case this notification icon has been deactivated within the TeamViewer settings, you can simply click on Help >Check for new version. TeamViewer can install new versions automatically. This option can be found within the settings under Advanced >Install new versions automatically . Simply right click on the TeamViewer icon within the system tray and select Check for new version. Does it work behind firewalls, proxy server and NAT routers? Yes! That is what we made TeamViewer for. TeamViewer will allow you to share your desktop over any kind of internet-/LAN-connection and over almost any firewall. Why does my antivirus software come up? Please update your TeamViewer to the newest release available within your major version. Also, please make sure that you do have the newest virus definition of your antivirus software. Where do I find the TeamViewer logfiles? If you create a support ticket on our website, in most cases our support team will ask you to send them your log files. Within these log files various connection- and software-problems are being protocolled. Please note that we always need the event protocol of both partners. Aside from that we need the approximate time when the problem occurred. The Windows folder that contains the event protocol will be opened. Why do I get the message "This site is running TeamViewer"? TeamViewer will wait several minutes after windows-start until it will try to listen on Port 80 (if this Port is not taken by another application). If your application does not take the Port in that time-frame or the application is not started automatically, TeamViewer might have taken the Port. You can disable this behavior in TeamViewer version 5.1 or newer. Therefore, open the TeamViewer options underExtras > Options > Advanced. Enable the option Don't use incoming port 80 (recommended for web servers only) so that TeamViewer won’t try to take the Port again. What do I have to do if I forget my user name or password? How do I delete my TeamViewer account? For security reasons, only you can completely delete your TeamViewer account. Log in with username and password under http://login.teamviewer.com. Click on the Edit profile menu item at the top right corner of the page. Click on Delete account in the window that opens. Caution: When deleting your TeamViewer account, your entire account including the data it contains will be permanently deleted! What is the difference between TeamViewer and VNC? With numerous modules and features, TeamViewer goes far beyond the functionality of ordinary VNC solutions. The main difference is that TeamViewer works without port forwarding and configurations on firewalls and proxy servers. Configurations with TeamViewer are not necessary no matter if you need a solution for remote support, remote control, remote access, or online meetings.